This monitoring framework was developed in partnership with the UN Resident Coordinator's Office in India. The Sustainable Development Goals (SDG) Tracker Dashboard helps government agencies to measure, track and align their country's development efforts with the United Nations Sustainable Development Goals (SDG) framework. Government officials can use this dashboard to unify their entire development and program data, monitor goal progress across geographies and sectors, and undertake dynamic course correction in real time. Watch the video demo to learn more about this monitoring dashboard. Our Sustainable Development Goal (SDG) Tracker Dashboard takes data about government development initiatives from multiple sources — government databases, MIS systems, journals and reports. It layers that data with our rich repository of secondary data from over 600 public data sources. Then it analyzes and visualizes the complete data-driven picture of each of the 17 United Nations Sustainable Development Goals. Now a government leader can not only see the performance of their programs across the country, but also measure how they are contributing towards achieving the larger agenda of each goal. Identify gaps and trends across the entire country, different states or even districts. Plan interventions, both at a grassroot and a national level, to address critical gaps. 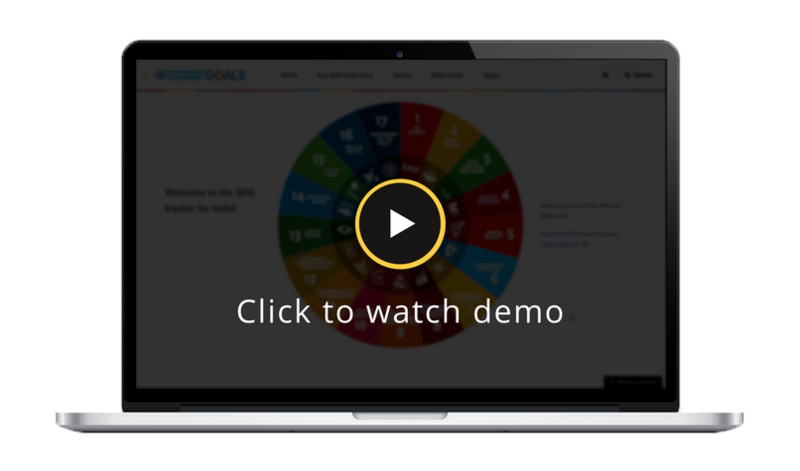 Measure how close you are to meeting targets under global goals through critical indicators. Align existing government programs to specific goals under the United Nations SDG framework. Track progress by comparing critical indicators against the national or United Nations benchmark. Poll the public to get real-time feedback on the country's Sustainable Development Goals (SDG) progress. Learn more about our partnership with the United Nations and the Government of India to build a monitoring dashboard to track India’s progress towards the Sustainable Development Goals (SDG).